About this Plastic 1 1/4 X 17 Back Scratcher Shoe Horn:The extra-long, 17" length provides easy use.Tough, ABS construction guarantees long lasting companionship.Loaded with features including feel-good scratching fingers, smooth-glide shoehorn, hanging hole and a huge imprint area to highlight your message.Material: ABS. About this Head Massager:Nothing feels better than a head massage, so treat your clients with this promotional gift. While it might look a bit scary, it feels heavenly. A great way to get a head of the competition. Products are not intended for use by children or pets. They may present a choking hazard to children under 3 years of age. Feels Great Wood Handle Pad Printed Free 3-Day Rush Feels Heavenly This Head Massager is a customer-favorite because it gives a startingly great massage that simply feels wonderful. Relieves Stress Using this promotional Head Massager is a great way to relieve stress, making it a perfect desk item during hectic work days. Pad Printed Handle The Scalp Massager features a wooden handle is pad printed with your logo or custom design on a 1.25" x .25" imprint area. Price Match Guarantee If you find these Gold Bar Paperweights customized cheaper elsewhere, AnyPromo won't just match the price, we'll beat it. Special Instructions:Rush order: Information received after 12 noon Pacific Time will cause the order to move to the next day production. About this Star Shape Massager:Lightweight Executive Massager.Glides Smoothly Along Body.Special Instructions:Rush Service:Catalog Quantities Only.One Color And One Location. About this Back Scratcher With Shoehorn:Ball Chain Attachment.Special Instructions:Rush Service:Catalog Quantities Only.One Color And One Location. About this Everlast Massage Roller Ball:Greatness is within at Everlast. Self-targeted trigger point massage. Features an easy to grip handle which allows the ball to smoothly roll in any direction. Ideal for reaching tight spots and rolling the pain out of muscles. Compact and portable.Material: Double Wall Plastic.Special Instructions:Other imprint methods/areas may be available; please call for details. Please note that product images may not depict the standard imprint method included in pricing. About this Star Acrylic Massagers:Star-shaped acrylic massager features five round balls at each edge to knead away tension. About this Round Massage Ball:This massage ball will help you relieve your stress...High density massage ball.Use your own body weight and gravity to help relieve muscle knots and tension.Material: PU (Polyurethane) Plastic.Special Instructions:Rush Service:The standard imprint method, 1-color/ 1-location is available. About this Back Scratcher / Shoe Horn:Combination back scratcher and shoe horn.Includes bead-chain for hanging. About this Kikkerland Head Massager:Give your whole body a relaxing feeling when you massage your head with the soft-tipped, flexible stainless-steel prongs. Handles are made of anodized aluminum. Assorted colors only. About this Cranial Massager:12 stainless legs with rubber tips and handle. Stimulates nerves on the scalp and neck. Increases blood circulation. NOTE: Product comes with Prop 65 warning label. Label reads: "WARNING: This product may contain carcinogen, which is known to the State of California to cause Cancer and Reproductive Harm. For more information, go to www.P65Warnings.ca.gov. About this Hand Shape Massager:Five fingertip-like pressure points.Also functions as business card / memo holder. NOTE: Product comes with Prop 65 warning label. Label reads: "WARNING: This product may contain carcinogen, which is known to the State of California to cause Cancer and Reproductive Harm. For more information, go to www.P65Warnings.ca.gov. About this Easy Reach Telescoping Back Scratcher:Extends to 18". Heavy duty construction. Easy grip handle. NOTE: Product comes with Prop 65 warning label. Label reads: "WARNING: This product may contain carcinogen, which is known to the State of California to cause Cancer and Reproductive Harm. For more information, go to www.P65Warnings.ca.gov. About this Foldable Travel Back Scratcher:Folds for easy storage. BPA Free. Recyclable. Heavy Duty Plastic. About this Bamboozler:Bamboo backsratcher with shoehorn.One color imprint only.Imported. About this Hand Shaped Back Scratcher With Shoe Horn:Hand shaped back scratcher with shoe horn. About this Backscratcher Shoehorn:This 2-in-1 back scratcher and shoe horn (one on each end) is made from PS material. The long length allows you to reach for pesky itches, as well as help you remove your shoes. It also features an attached beaded key chain for handy use. Customize with your logo to handout at trade shows, health promotional events, physical therapists offices and more! NOTE: Product comes with Prop 65 warning label when shipped to California. Label reads: "WARNING: This product may contain carcinogen, which is known to the State of California to cause Cancer and Reproductive Harm. For more information, go to www.P65Warnings.ca.gov. About this HoMedics(R) Portable Sound Spa:Create a peaceful sleep environment and fall asleep faster. Improve your sleep and health. Choose between four southing and rhythmic sounds: white noise, summer night, ocean waves, and rain. Built-in auto-off timer: 15, 30, 45 minute settings. Compact and convenient for travel. Includes: AAA batteries, not inserted.Material: Pouch: Dacron, Spa: varied. About this Backscratcher Shoehorn:If you're looking for a way for your brand to scratch a promotional itch, then our backscratcher and shoehorn is a perfect fit! Measuring 19" x 1 1/2", this 2-in-1 item is artfully crafted from bamboo and allows you to reach for those pesky itches, and it features a shoehorn on the other side. Customize with your company name and logo to increase brand visibility on a handout that will make an ideal addition to trade exhibitions and health promotional events. NOTE: Product comes with Prop 65 warning label when shipped to California. Label reads: "WARNING: This product may contain carcinogen, which is known to the State of California to cause cancer. For more information, go to www.P65Warnings.ca.gov. About this Backscratcher Massager:This backscratcher and massager will help your brand scratch a promotional itch! Measuring 19" x 1 1/2", this handy item is artfully crafted from bamboo and allows you to reach for those pesky itches, and it features a massage roller on the other end to loosen up your muscles. Customize with your company name and logo to increase brand exposure on a handout that will make a perfect addition to trade exhibitions and health promotional events. NOTE: Product comes with Prop 65 warning label when shipped to California. Label reads: "WARNING: This product may contain carcinogen, which is known to the State of California to cause cancer. For more information, go to www.P65Warnings.ca.gov. About this 19 Back Scratcher:19" Wooden back scratcher with massage rollers. Strong and durable, superior to its plastic counterparts that break easily. Perfect for itch and stress relief. Comes with a mini roller on opposite end for massaging. Perfect for promotions related to health, stress, and just as a fun giveaway. Back Scratcher Massage Roller Durable Wood Relieves Itches & Stress Back Scratcher Features a back scratcher on the end which is great for relieving itched in hard to reach places. Massage Roller The other end has a massage roller that's perfect for massaging out muscle knots in hard to reach places. Relieves Stress This 19' Back Scratcher & Massager is a prized gift because it is great for relieving stress at the end of a hard day. Sturdy Wood Made from solid wood, which is stronger than plastic and is sturdy enough to stand up to normal use. About this Exerciser Massager:A unique way to advertise your company, this handy product promotes a healthy lifestyle. 2-in-1, this product functions as both a hand exerciser / squeezer and massager (includes both a rolling ball for targeted spot massages & a bumby surface massage). Available in different color options, this item makes a great giveaway for gyms and healthcare centers. Flex your promotional muscles with this handy item! NOTE: Product comes with Prop 65 warning label when shipped to California. Label reads: "WARNING: This product may contain carcinogen, which is known to the State of California to cause cancer. For more information, go to www.P65Warnings.ca.gov. About this Folding Backscratcher Massager:Scratch a promotional itch with help from this folding scratcher and massager. 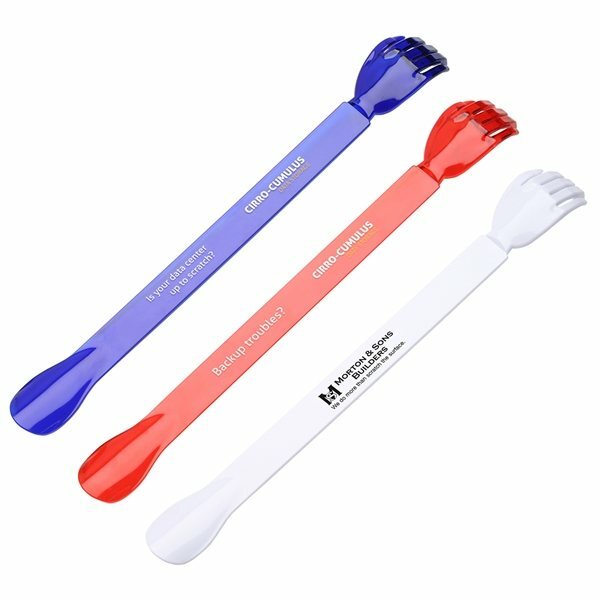 Measuring 7" x 1 1/2" and available in red, white and blue, this handy 2-in-1 product features a bumpy surface massager and a back scratcher, and it folds down to a slim shape for on-the-go use. What a great giveaway for gyms, healthcare centers and more! NOTE: Product comes with Prop 65 warning label when shipped to California. Label reads: "WARNING: This product may contain carcinogen, which is known to the State of California to cause cancer. For more information, go to www.P65Warnings.ca.gov. About this Massage Key Chain:This handy mini body massager is a great giveaway for gyms, healthcare centers and more!Customize with an imprint of your company name and logo to heighten brand exposure on a useful product. Includes a beaded key chain attachment for on the go use! NOTE: Product comes with Prop 65 warning label when shipped to California. Label reads: "WARNING: This product may contain carcinogen, which is known to the State of California to cause cancer. For more information, go to www.P65Warnings.ca.gov. About this Kikkerland Brass Back Scratcher:Extendable 5-pronged brass back scratcher. Extends to 20" for those hard-to-reach spots. About this Kikkerland Brass Head Massager:Give your whole body a relaxing feeling when you massage your head. With a beautiful copper shine this Brass Head Massager reduces tension by stimulating sensitive nerves in scalp with its soft, white rubber tips. About this Capsule Invigorating Massager:Capsule invigorating massager.Battery: 2 x AA (Not Included). About this Basketball Invigorating Massager:Basketball invigorating massager.Battery: 2 x AA (Not Included). About this Baseball Invigorating Massager:Baseball invigorating massager.Battery: 2 x AA (Not Included). About this Football Invigorating Massager:Football invigorating massager.Battery: 2 x AA (Not Included). Thank you Martin, Ricardo and Omar for your reviews! We are glad to read your positive reviews on our Shoe Horn Back Scratcher. Don’t try to reach for the itchy part of your body without this promotional Shoe Horn Back Scratcher. You’ll love to have this in your hands to scratch or massage your back! Thank you Kelly and Grant for your reviews. This item is fun marketing tool to giveaway! Many customers love to have this item because of the relaxation it gives. What better item to massage your head? Relax your head with this promotional Head Massager. Your customers will love to have their very own at home! Nothing feels better than a head massage, so treat your clients with this promotional gift. While it might look a bit scary, it feels heavenly. A great way to get a head of the competition. Order your Head Massager here. Thank you Serenity and Alicia for your reviews. We’re glad to read how well our promotional Hand Shaped Back Scratcher With Shoe Horn is! You won’t want to miss out on this top seller. Give your customers the product that will help them feel at ease! Hand shaped back scratcher with shoe horn. In our selection of promotional massage items, you’ll find many different items for your next event! We have back scratchers, wooden massagers, head massagers, massage roller balls, massage key chains, and more! Promotional massage items are great for all occasions, especially events that help promote wellness and safety. Promotional massage items are fun for customers to have at home. Promotional massage products are for everyone! Who doesn’t love a good massage? Whether it’s for the head, back, or shoulders, our promotional massage products will help deliver the perfect massage. Look through our selection of massage. Shop here! Our durable custom massage products are specially priced and professionally imprinted to promote your brand in the best light. Search our site for a great selection of back scratchers, shoe horns and more! See for yourself just how high AnyPromo’s standards are when it comes to brand impact. Click through our inventory of promo massage items on sale now. Here is a snapshot of our selection of custom massage products currently available. We’re ready to help expedite your order, so give us a call! Grab your promotional gifts today! 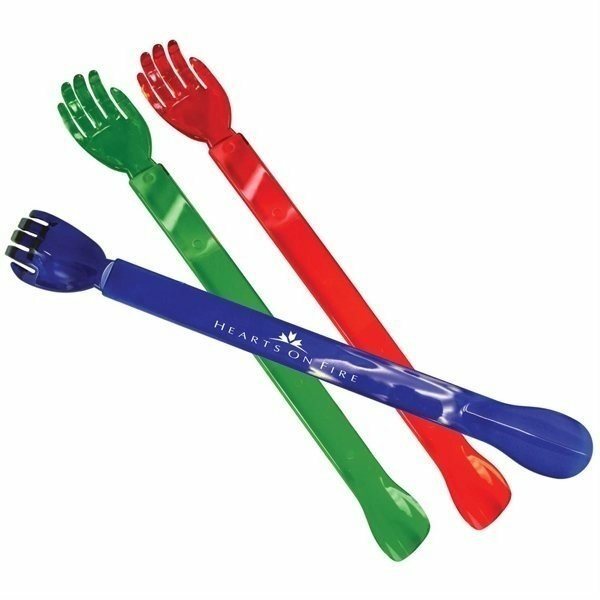 Promotional massage items are a fun item to promote your company logo with. You’ll be helping your customer’s wellness by promoting relaxation with promotional massage products. Have any questions regarding our promotional massage selection? Live chat with one of our customer service representatives to help answer all your questions! They are standing by ready to help you. Our featured list of massage products are currently trending in this category. You won’t want to miss out on these products.